For the site in the Nile Delta, see Abusir (Lake Mariout). Abusir (Arabic: ابو صير‎‎ Egyptian Arabic pronunciation: [æbuˈsˤiːɾ]; Egyptian pr wsjr; Coptic: ⲃⲟⲩⲥⲓⲣⲓ busiri, "the House or Temple of Osiris"; Ancient Greek: Βούσιρις) is the name given to an Egyptian archaeological locality – specifically, an extensive necropolis of the Old Kingdom period, together with later additions – in the vicinity of the modern capital Cairo. The name is also that of a neighbouring village in the Nile Valley, whence the site takes its name. Abusir is located several kilometres north of Saqqara and, like it, served as one of the main elite cemeteries for the ancient Egyptian capital city of Memphis. 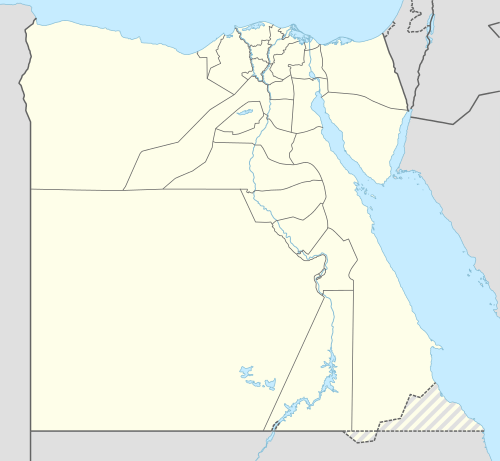 Several other villages in northern and southern Egypt are named Abusir or Busiri. Abusir, Saqqara and Dahshur suffered damage by looters during the 2011 Egyptian protests. Part of the false door from the tomb of the priest Rahotep was stolen, and store rooms were broken into. Systematic looting continues into 2013 with organized digging and destruction of tombs and mummies. Köppen-Geiger climate classification system classifies it climate as hot desert (BWh), as the rest of Egypt. Wikimedia Commons has media related to Abusir. ↑ "Egyptological Looting Database 2011". 1 2 "Climate: Abu Sir - Climate graph, Temperature graph, Climate table". Climate-Data.org. Retrieved 28 October 2013. 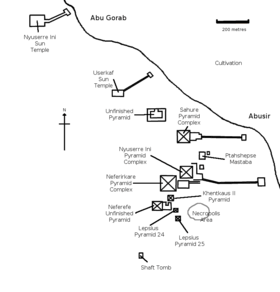 Wikivoyage has a travel guide for Abusir.